We’re pleased to be able to work with the people at RenewEconomy to help make global complexity more understandable – in this case, in terms of the contributions of various generation fuel types across a growing number of locations (currently 29 locations across Australasia, Europe and North America with more coming…) . We’ve built this to address one of the common points of feedback we received over the past 12 months or so of providing our NEM-WatchTM widget (accessed here and here and discussed here) to a growing number of people. Thanks Ketan! 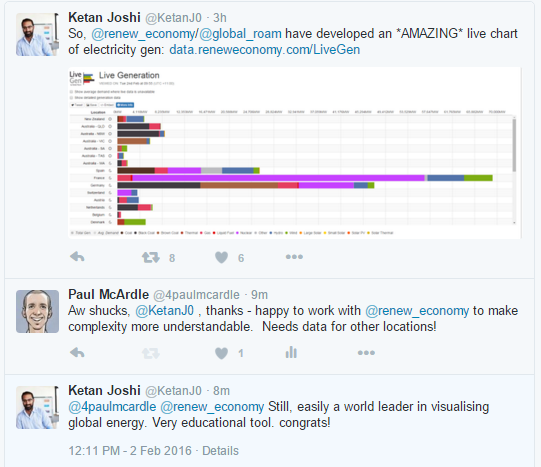 Always nice to hear when what we do helps to clarify something about the energy sector. We’re looking for more locations to add in – let us know if you know of some!